In 1988, Kat Connors was without a mother. Eve Connors disappeared after living in a stale marriage for several years and basically vanished from right off the face of the earth. Three years later, Eve was found. 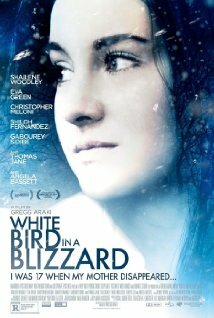 White Bird in a Blizzard is a film adaptation of the Laura Kasischke novel of the same title that tells the story of seventeen year-old Kat Connors and her life following the disappearance of her mother. Kat (Shailene Woodley, Divergence), is a product of a broken home. Her mother Eve (Eva Green, Penny Dreadful) had impossible standards for Kat and her dullard father Brock (Christopher Meloni, Law and Order: SVU) does not provide excitement for either of them. The family dynamic is explored through flashbacks that show the bad times and the worse times. It is clear from the beginning of the movie that Eve never loved Brock, hence creating a hostile family atmosphere. Kat also visits with a therapist that further details the family tribulations. During the three year span of Eve's disappearance, Kat continues her relationship with the less than Harvard-like boy next door Phil (Shiloh Fernandez, Evil Dead). Once again, revealed in flashbacks, it appears that there was jealousy from Eve towards Kat for her relationship with the new neighbor. Mid-way through the film, the story fast-forwards to Kat's Spring Break from her first year at college. When she returns, old skeletons are dug up, figuratively....and literally. White Bird in a Blizzard starts off with a bit of a dark comedy vibe. Meloni plays such an awkward, gawky character; similar to if Napoleon Dynamite's brother, Kip, was all grown up and miserable. Throughout the film, the dark aura around the Connor family increases and the film becomes bone-chilling and tension filled. Green is absolutely terrifying in her portrayal of a woman who has given up on the world around her. Her bulging eyes and trembling voice send shivers down your spine. It's truly incredible how well she emotes the misery of a stale marriage and the failure she feels in her life. Woodley delivers a solid performance as an angsty teenager who is attempting to hide her feeling regarding her mother's disappearance. She and Fernandez have a solid chemistry on screen and her emotions are genuine and not overdone throughout. Stylistically, the film is shot well with beautiful scenery and stays true to the eras. During the 1988 portion of the film, the colors are vibrant and the fashion is on point. The slang, while a minor factor, is done properly and adds to the depth of the script. Writer-Director Gregg Araki does a wonderful job of pacing the film and guiding the viewer through a tension filled, nail-biting story that any young person would dread living through. White Bird in a Blizzard is currently streaming on Netflix and can be purchased on Amazon, along with many other retailers.